My desire for chairs I cannot have seems to be a recurring theme. I’ve been moving furniture around again, and have made space for a chair in the living room by moving my antique lamp table into my bedroom and sending the previous nightstand—a too-large Eastlake table—out into the wasteland of my garage—which wasteland is actually much improved thanks to a carload of donations, the redistribution of eight mismatched folding bookshelves from several of my previous habitations, and the reentry of one of my grandmother’s chairs into my living space. So, here’s the current configuration of my living room—I generally call this the “Christmas” arrangement since it leaves room for a small Christmas tree. I would really hate to deprive the feline occupants of my house the annual pleasure of tipping over a plastic evergreen and wrestling its breakable decoration to the ground. The colors are perfect, and we know that I have a thing for things with animals on them. Also, a thing for bird chairs, it would seem. Two problems, though: 1) half-price still means crazy, because it’s Anthropologie 2) my cats scratch everything they can find into tiny shreds; if it can’t be scratched, Hop will just eat it instead. Lovely colors, lovelier price tag than even the half-price parrot chair—but same major cat-problem. All of my soft furniture currently boasts white slipcovers—I didn’t even consider the possibly impracticality of this choice, as it’s such a familiar aesthetic to me. The barrel chair, which was my grandmother’s, has been wearing that white twill slipcover for almost twenty years without any real incident. 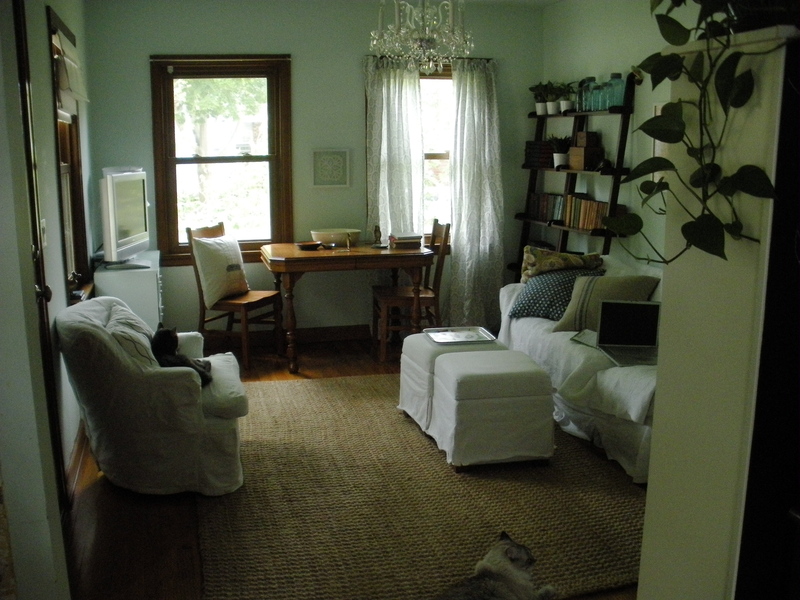 The white shows stains quickly, but also gives them up quickly in the wash–and the slipcovers do get snagged and torn by cat claws over time, but it’s nothing like what they can do to the tightly-pulled fabric on upholstered pieces like these chairs. I am still horrified by what one Mr. Cat did, long ago, to a wingchair belonging to my future mother-in-law. Now that I think about it, that chair also had birds on it. I don’t know why I’m even bothering with this obsession. If you look closely in the picture of my living room, Hop is asleep in my grandmother’s chair. When he’s not there, another cat takes his place. It’s virtually impossible for any human being to ever sit down in that spot—and my cats seem to like my grandmother’s chair just fine. 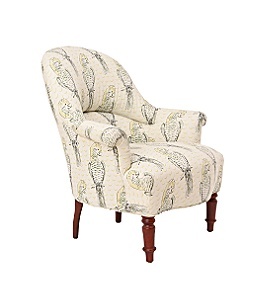 Maybe someday I’ll just have a new bird-y slipcover made for the chair I already have. it’s amazing how much difference in space that one round table makes. i know! tiny, tiny house.